Morrison’s shorts are violently beautiful morsels, full of ghostly imagery that’s subjected to solarizing, optical printing and other textural manipulations until they resemble the fluid pictures on the insides of eyelids, but writ large and poetical. Whales, trains, movie projectors and the lines on highways are thus transformed into stunning, hypnotic ruminations on history and memory, fate and human intervention.” – Los Angeles Weekly, April 2, 1998. – Jan-Christopher Horak on Footprints. 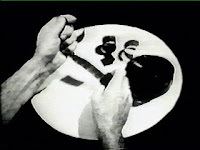 Bill Morrison’s prize-winning films have been widely acclaimed around the world and acquired by the Museum of Modern Art in New York. In 1995-6 he received a year-long fellowship to work at Fabbrica, an Italian image studio under the direction of the Benetton group, where he produced The Film of Her. – Los Angeles Weekly, le 2 avril 1998.